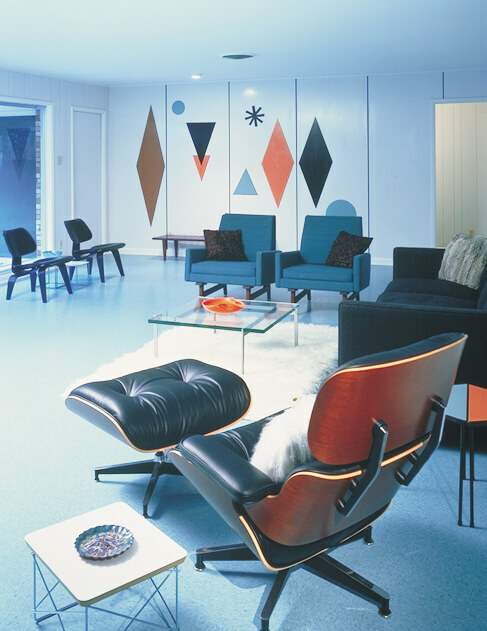 During last week’s laminate ramblings, I stumbled on this incredible 1959 house in Texas – it’s the original home of the founder of Wilsonart laminates, and it’s now owned by the company, serving as their archives and a space for corporate events. 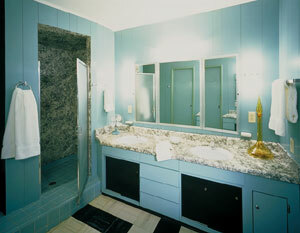 All photos: Courtesy Wilsonart – who were fabulous, very responsive! Thank you, Diana Z.! The story of the Wilson House’s salvation is right out of a retro renovation suspense novel. 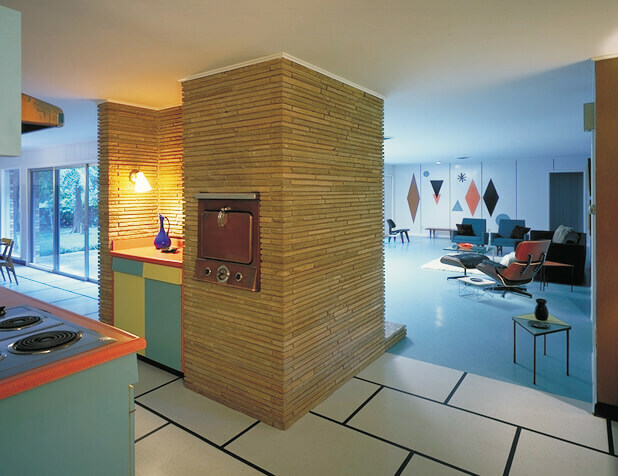 10 years ago, when there was little appreciation for this type of mid century modern design and certainly not for something as pedestrian as laminates, the company decided to sell the house. But, it needed to gut it first due to the “problem” interior. 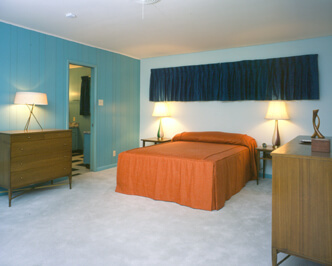 The house had been built as a showcase for the use of laminates – so the stuff is everywhere but the ceilings and floors. It’s truly incredible. Then — someone brand new to the company is taken over to the house on the very day they are going to start demolition. She has historical sensibility – and passion – and stands in front of the bulldozer. Well, there was no bulldozer. But she did stop the demo…convinced the company to keep the house…and went on to lead the restoration of what is now the youngest-ever National Historic Landmark. Her name, by the way, is Grace Jeffers – and I will do more features on her soon. She is my new idol (along with Courtney and so many of you readers!) 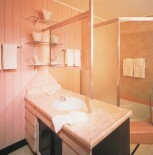 She has gone on to many other fabulous projects in the world of man-made materials. Holyoke Cindy was the first one to mention here that laminate kitchen cabinets are a great solution for our midmod kitchens – and she is absolutely positively right. 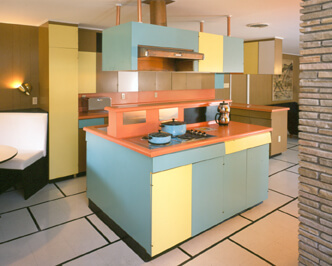 Cindy’s kitchen is totally appropriate to her early 60s contemporary…and this Wilson kitchen, with its Mondrian influences, undeniably gorgeous, is further proof that laminates are a great and worth alternative for our retro renovations. Thank you, Grace. You did a good thing. Click here for a history of the house on the Wilsonart website, and here to a New York Times story circa 1998 on the Wilson House – well worth it. I have saved the photo of that wall, and someday plan to have a wall like that in my home. It consists of inlaid laminate panels. How cool! 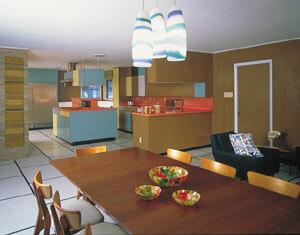 Also, I would never have considered orange counter tops, but the ones pictured have made me re-think that. I had always thought bright colors should not be used on counter tops, but the photos of orange, yellow and turquoise ones on this site have opened my eyes to new possibilities! And that, after all, is what the ’50s were all about in America. I visited Ralph and Sunny’s home many times from 1964 to 1966 while working my way thru college. I worked for Ray Vance and associates accounting firm in Temple and often had to pick up and return paperwork to and from the home. Mr Vance later went to work for Mr Wilson as comptroller. My fondest memory is seeing the former ‘Sunny Fairweather of New York City each time I was at the home. What a nice lady who always graciously invited me in and always offered me something to eat or drink. She would then sit me down and we would talk about anything until I had to return to work. Good memories.